Of the many classic movies I’ve had recommended to me, this one surprised me with how much hype I received for it. Seems as though most people I know, especially the women, really love this film. After I started watching, I did get vague recollections of walking through the living room as a kid and seeing it on the tv, before promptly leaving to play with my toys. I mean, why would I want to watch an ‘old film’ right? 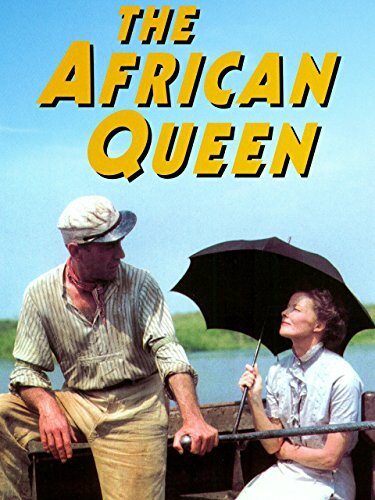 This movie centres around the two main characters being forced to share a boat together in Africa during World War 1. It’s essentially a story of romance, teamwork, and overcoming adversity. It’s interesting that I should watch this immediately after I saw Rebel Without a Cause. In my review of that, I said that it was about young men looking for strong male role models. In this, the attraction to Charlie from Rose comes from him exhibiting various desirable male traits. The number one thing he shows is capability. Charlie demonstrates various skills and also that he’s prepared to do what needs to be done, even if that means jumping into leech infested water to pull the boat himself. What gets even more interesting, is that Rose is a strong female character. As well as being supportive of Charlie, she’s also prepared to muck in and do physical work, and even offer to play the hero toward the end of the movie. The best part of all this is that neither character is trying to outdo the other. There is mutual attraction, and respect by the end, but not at the expense of their differences, whether they be gender based differences or that one likes gin, and the other likes tea. It’s the two of them coming together and working as a team, both to benefit the war effort, but also their lived and happiness that is the main takeaway, by being who they are. This was an enjoyable film. It’s got a Sunday afternoon vibe to it, with lots of tea, and biscuits.